because as soon as you turn on you WiFi your packet data got disconnected. 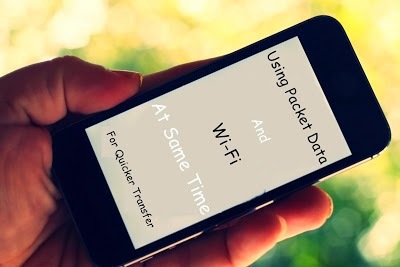 and now here at i am going to introduce you to one such apps that will help you to do use packet data and WiFi at same time So now without wasting way more time lets come back on this superb however useful trick. Just click on download link and if this application recognize your it , it will start downloading that thing itself.but if this method doesn’t work then click and hold the link and then from the menu that will appear click on “Share with” and then choose Super Download. Finally you can copy and then paste URL In “Add URL” Dialog and you can can set to speed up your download. Using Both of the networks, packet data and WiFi require root access.And also remember to say “authorize” to the superuser prompt. As you are using WiFi along with your packet data , you may incur in additional charges from your network operator for using packet data only. To make the software use it’s full power , this software requires good and balanced WiFi And mobile packet data without any dis connectivity. Some web server may not provide to much downloading speed as will your packet data and wifi will give simultaneously. The Lite version or free one has a file-size limit of 50 megabytes.